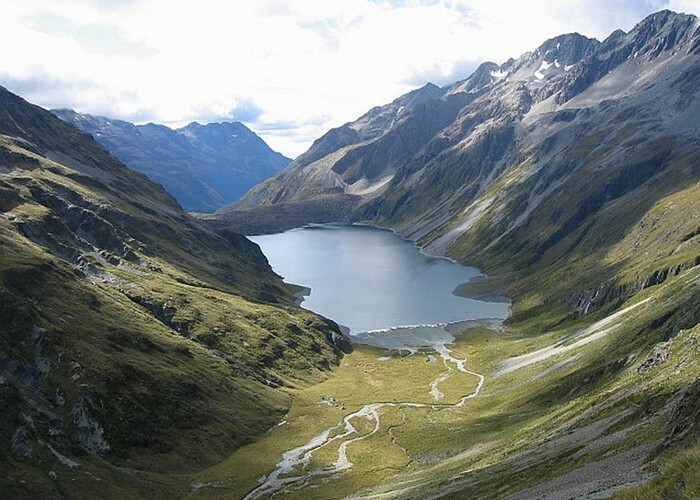 5 day trip accessed by kayak up Lake Rotoroa. Easy bush travel up and down Sabine and D'Urville valleys respectively. Sub-alpine tramp over 2 passes to connect the two valleys with section of unmarked route. We did this trip starting 26th December 2010, and found only the West Sabine Hut to be very busy. Two days of heavy rain may have had something to do with this! Waiau Pass towards Thompson Pass • By apurdam. Licence: cc by. Day 1: 2 hr sea kayak paddle from jetty L. Rotoroa to Sabine Hut. 5 hrs walk to W. Sabine. Easy marked track. Day 2: W. Sabine to Blue Lake 3.5 hrs. Alternatively parties with a tent could camp near L. Constance or at Thompson Pass. Easy marked track. 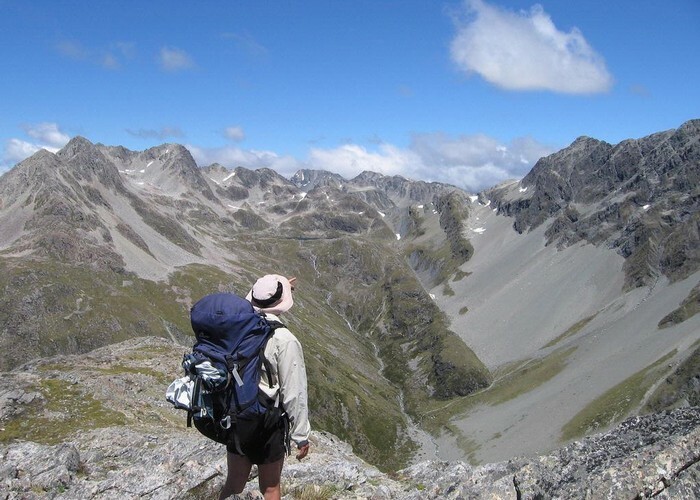 Day 3: Blue Lake to Upper D'Urville Hut via Waiau and Thompson Passes. Took us 10.5 hrs in fine weather (~ 6.5 hrs to L. Thompson and ~4 hrs to Upper D'Urville Hut. Follow poled route all way to Waiau river (recently remarked by DOC). Route down to river roughly follows a fault line and the ascent route up to L. Thompson is obvious from the descent route, following a second slightly offset faultline. On reaching the river travel either side to reach the fault line on true left. Ascend the fault line to L. Thompson. This would be a great bivvy spot in fine weather. Continue up the fault line to the pass (~ 50m). This is marked on topomap below as a side creek off the main Waiau river. We hit patches of old snow in the faultline creek which we easily ascended or sidled above as we didn't have ice axes or crampons. Earlier in season, ice axes and crampons would be needed. There are occasional cairns on beginning of descent down from Thompson pass. We sidled rightwards to reach scree slopes then descended down to the creek. Also occasional cairns from here down to beginning of DOC marked track in bush. Slow travel either boulder hopping down the creek or thrashing through the vegetation. Once you spot the first orange triangle travel becomes much easier. Day 4: Upper D'Urville Hut to Morgans Hut 7 hrs (3 hrs to George Lyons, 4 hrs George Lyons to Morgans). Follow the marked track. Day 5: Morgans Hut to Sabine 6 hrs. Paddle back to L. Rotoroa jetty 2 hrs. Follow the marked track. At end of d'Urville if water levels are not high, you can cut out some of the marked track which still goes up and down at this point, by bee-lining down the river bed and crossing D'Urville above the point marked by DOC. Added 9 January 2011 by Laura & AdrianLaura & Adrian. 1 revision 9 January 2011 by Laura & AdrianLaura & Adrian. 199 views in the past year (17 per month).